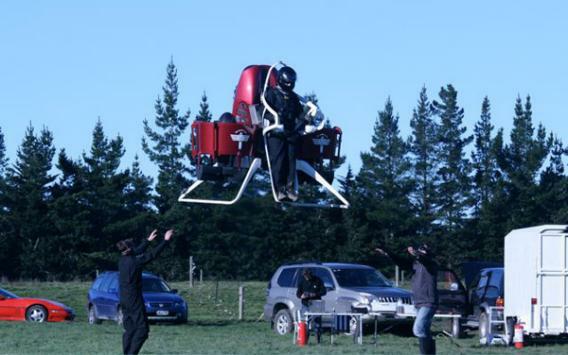 New Zealand has approved manned test flights of the newest version of the Martin Jetpack. Hoverboards aside, the future isn’t shaping up so badly after all. We were promised flying cars, and soon we may sort of have them. I’m not sure if we were promised jetpacks, but thanks to 30 years of hard work by a Kiwi inventor named Glenn Martin, we might soon have them, too. Or at least, some firefighters in New Zealand might. AFP reported this week that New Zealand’s Civil Aviation Authority has granted Martin Aircraft a permit allowing the company to run manned tests of its new Martin Jetpack prototype. For safety reasons, the test flights will be limited to an elevation of 20 feet over land and 25 over water. Still, the approval paves the way for the company to try to meet its stated goal of selling its first jetpacks to the military, first responders, and other authorities by the end of 2014. It’s hoping to develop a simpler commercial model for sale to the general public by 2015, with a price tag around $100,000. Whether it can deliver on those ambitious promises remains to be seen. According to AFP, Martin started working on the concept in his Christchurch garage in the early 1980s, inspired by old TV shows like “Thunderbirds” and “Lost in Space.” In 2011 the company sent a jetpack with a dummy pilot 5,000 feet into the air in a previous prototype. The new version, called the P12, is said to be sleeker and more maneuverable. It’s worth mentioning that it actually isn’t technically a “jet” pack. It’s powered by a two-stroke V4 engine that generates 200 horsepower. That’s modest for an aircraft, though apparently plenty to lift a full-grown man high into the sky and allow him to cruise at a ground speed of about 35 mph. The video below is the first to show a remote-control test flight of the new prototype. It’s not quite Rocketeer-quality yet, and it’s not immediately clear what its practical uses will be. The company is pitching it as a cheaper, lighter alternative to helicopters, which it says might be of use to first responders in reaching disaster victims. Greg Tyrrell, the company’s R&D manager, told me he expects people will find more uses for jetpacks as the technology evolves. “If you go back 100 years to when they were building the first cars and first motorbikes, they probably seemed pretty impractical to some people, but we’ve seen where that’s come,” he said. For now, if nothing else, it’s something new to daydream about the next time you’re stuck in a traffic jam.